Trail running is an entirely different animal from traditional running. In my personal opinion, trail running requires more meticulous planning in terms of nutrition. A trail runner has to take into consideration that aid stations might be non-existent or few and far in between. Trail running also requires varying energy levels, depending on the terrain faced with at any given point during the run. Considering how taxing trail running is on the body, planning well is the key to a good run. Things to consider are how long you are planning to go (is it a half-day trail run? Whole day? Etc.) Are you doing the trail for enjoyment or to get a personal best? When you have established these 2, then you can plan your nutrition arsenal next. This is a bit tricky considering you need to pack as light as possible with the maximum nutritional benefit. Most trail runners have their food staples during a run. More often than not, various sandwiches, cookies, biscuits and energy bars populate the bag of a trail runner. If your goal is to simply enjoy, then solids are not a problem. You can eat during the run and supplement with the other options (discussed below). However, if your goal is to hit a personal best, then eating solids during a trail run is not advisable. More often than not, solids are packed in fear of feeling hunger pains during a run. Scientifically speaking, solids will help you feel “full” but in terms of providing energy for the run, liquids and gels assimilate faster and are more efficient in providing energy. There have been a lot of runners who have fallen into the trap of eating too much solids during a race. The result: a heavy feeling in the stomach due to undigested food. Instead of helping you with the race, consuming large amounts of solids may be counterproductive. You also have to remember that digestion also takes energy, energy that you could be using for your run instead. 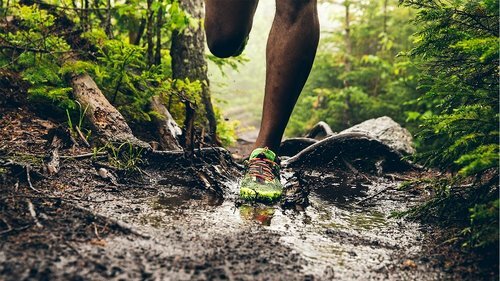 For a more efficient trail run, you will need energy sources that assimilate quickly into the body. Fuel sources such as liquids, gels, energy blocks, and caffeinated gels are less bulky than your traditional solids and provide an efficient source of energy for endurance sports. These forms of sports nutrition supplements assimilate into the bloodstream quicker than solids because they process of digestion is a lot shorter than that of solids. With the mentioned, you get the fastest energy delivery possible without taking much energy away from your body for digestion. Other key sports nutrition aspect that needs to be considered for a trail run are hydration and electrolytes. For hydration, the key is to remember to drink lots of water but stay away from distilled water. If you are lucky enough to run into a vendor selling coconut water, feel free to buy and drink up! Contrary to popular practices, taking electrolytes does not mean ingesting table salt. A full spectrum of electrolytes include Sodium, Potassium, Calcium, Magnesium, Chloride, among others. Taking just one component of electrolytes will cause an imbalance in your body and may eventually lead to cramping. Lastly, do not forget to practice everything you want to implement during race day. Implementing a full-scale sports nutrition plan only on the day of your race can result in a sensitized stomach.